It’s Christmas Eve, the day before the day we’ve all been waiting for, and, wow, has it been a crazy week or what! So, my morning was spent helping out my local dogs trust, and then, I came home, got in to my pajamas (at like 10.40am) and watched ‘The Santa Clause’, one of those classic films you just can’t miss out on! It’s one of those that really warms your heart, and is definitely one of my favourites! However, following that, instead of watching HP & The Chambers of Secrets like I wanted to, the brother had to be picked up from work; and it was the last time I could get out to the shop before they all closed! The worst thing was, that it meant I had to get out of my pajamas! Anyway, at the shop, a last minute present was bought, a pack of batteries for brothers ”mouse trap” present was bought and some chocolate, because, why not! I also got some baking paper, which, after yesterdays fiasco with the poor ‘thing’ I tried to create, it’s most certainly needed! Back home, (and back in my pajamas) the presents were wrapped and put under the tree, and the baking commenced! Using the big old cook book, I created something that resembles a chocolate yule log! A lot of breakages happened, but, with enough cream, and chocolate icing – the bit where it sort of broke in to three pieces, was fixed – and it actually came out looking like a log fo a tree!! A pale one, but still a log! It might not look completely right, but everything tasted good on it’s own, so I’m sure, that when it’s cut in to tomorrow, it’ll taste amazing! It’s Christmas, you can never have enough chocolate, right? But, anyhow, the presents are done, the food that needs to be defrosted is being defrosted, the cheesecake set beautifully! And, I spent the day in my pajamas watching movies! Anyway, the last twelve days of this Blogmas have been crazy! I had most of it planned out, but, the last few days got rough and posts got rambly! I guess that’s just Christmas for you though, right? I had more plans and more blog posts for this whole thing, but, nothing really went to plan, and I guess, if anything, there’s still next year, isn’t it! If anything, its been fun! I’ve enjoyed making myself write a little everyday, if anything, it proved to myself that I could do it! Although, my book has suffered these last few weeks! I’ve worked on it in some way a little everyday, and I’ve even wrote two short stories about it! One, I posted on here for Day 3 of Blogmas, when Ryan met Rudolph, and another – that’s still in my drafts – and concerns Url and his want to runaway to bard school, both of which were inspired by my 12 Days Of Promptmas prompts! Which I think have been the funnest to do! It’s made some of these blogmas posts so much easier to do! It’s also let me get to know my characters even more than I thought I could, and I think, if anything, it’s kept my mind on them when the reality of Christmas is trying to take me away from it! My characters would most probably resent the fact that they had to invite me in the first place! I’m not nice to any of them, and they’d probably try to poison me with wine or something like that! But, say I did survive the whole initial thing. I would see Derrick, Tobin and Rhys (who are the least likely to poison me with turkey, thank god) cooking the food, Mel would probably be trying to help, but most likely, she’d just be sat there scoughing her face with chocolate! As for presents, apart from a knife in the back (or the front, depending on the character), I might get some that don’t include trying to kill me! And, just for the sake of it, here are the eleven other Promptmas prompts! To end this off, I hope your all ready for Christmas, and that the rest of the eve is spent drinking hot chocolate, eating food and watching movies! Or, if it’s nice and hot where you live, that you’re sitting by some pool with a beer or a coke! I’m gonna end mine with the Anchorman! The Legend of Ron Burgandy! I’m not a big lover of peanut butter, but these cookies are absolutely amazing! I found the recipe when wanting cookies, but not having any butter or oil! They just turned out to also be great for the sit-downers of the world! With some low fat peanut butter, they are considered Skinny Cookies. 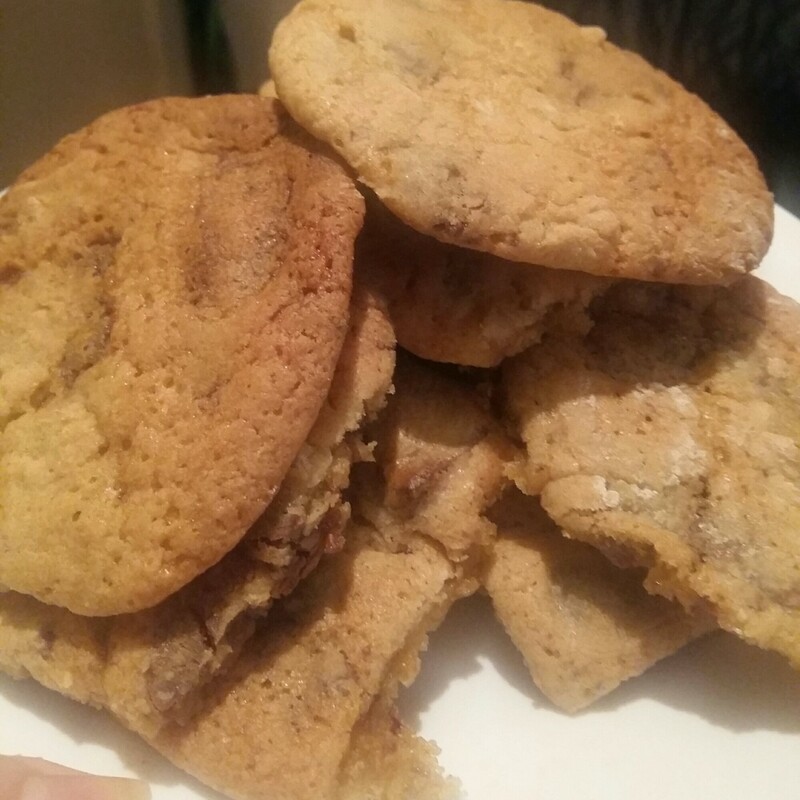 Take away the chocolate – uhm – and they’d be even ‘skinnier cookies’, but the chocolate is obviously the best thing! Or raisins or whatever else you want instead of the chocolate! Firstly, preheat your oven to gas mark 4/180C. Then, mix your sugar and peanut butter! Its best to do this with a blender or electric whisk, but if your not worried about a bit of graft, you can mix it yourself, just make sure its blended well! Now, add in your two eggs one at a time and it should turn nice and smooth! Add in your vanilla essence at this point and mix it in well! Now, prepare your dry ingredients – flour, oats, baking powder and cinnamon and mix the two together! It get’s really stiff at this point so it’s probably best if you add in the chocolate at the same time as all your other dry ingredients so the mixing of it is a little easier! I didn’t, but just used my hands to knead the chocolate in at the end and it turned out the same! This is when you make sure you take a little taste to make sure it’s up to standard before you put in on a baking tray and in to the oven. Or just eat it all raw… Because everyone does that right? 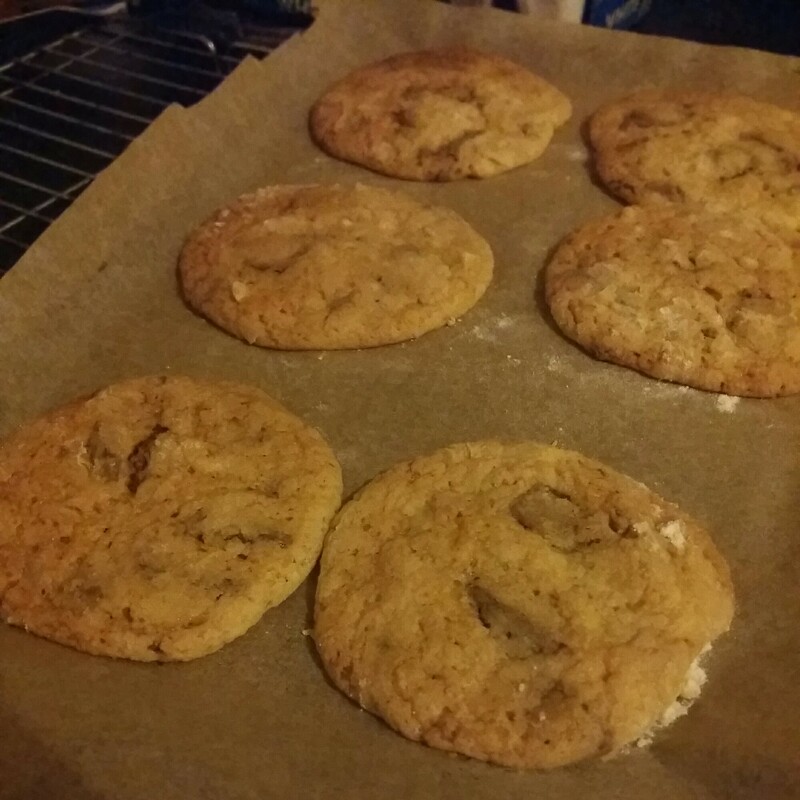 If you still want to bake it, line a baking tray and scoop up little balls (I used a ice cream scoop) and push them down in to cookie shapes. Now, put them in the oven for 15 minutes and leave them to cool for about 15 minutes, turning them over to let the underside air out after ten. Use a spatula or cake slice to slide them off the baking paper once they’ve cooled a bit and transfer to a wire rack. Lastly, make sure your cat(or dog, or hamster) doesn’t try to eat them and eat them yourselves! They taste amazing and are perfect for the office workers, the writers, the editors, the readers and just about everyone really! Just keep writing, with cookies at your side! I love to bake, I really, really do, but often times, the most simplest of recipes can illude me. This time. It was shortbread. 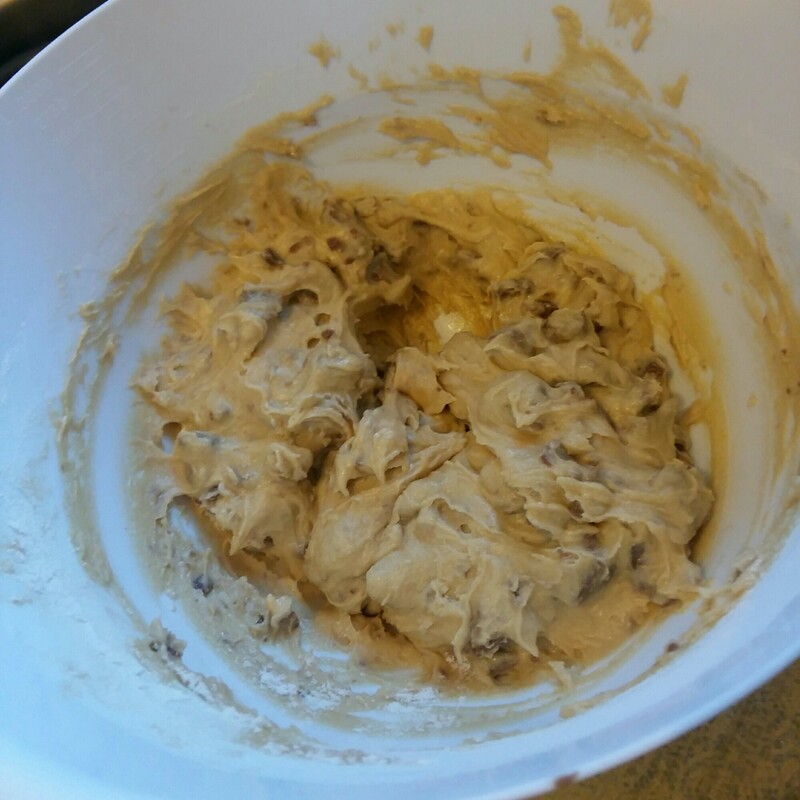 So, all you need to do is mix it together well and knead in to a dough. Then roll it out, probably to a 1cm thickness and cut it in to shapes. 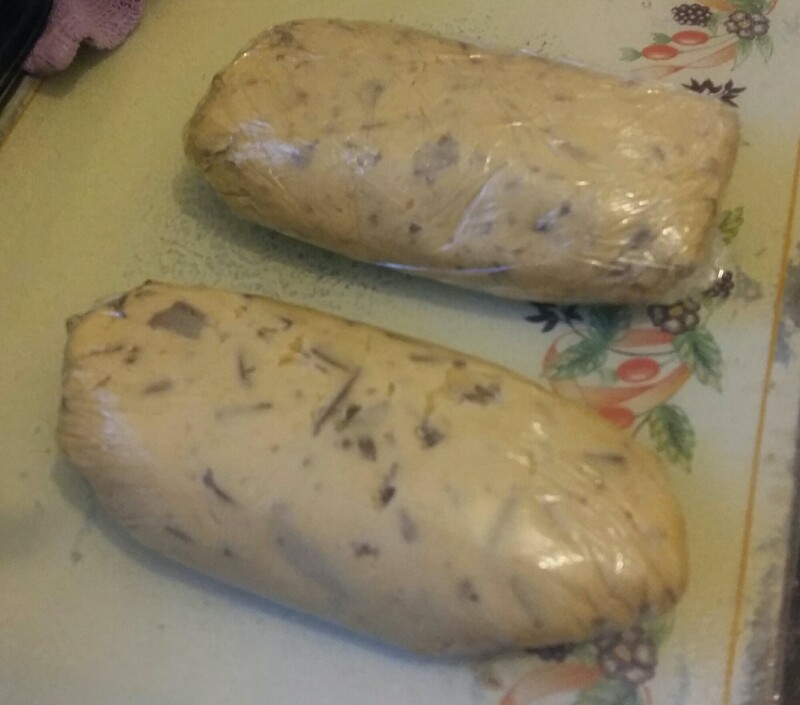 Then, throw it in to a pre-heated oven at gas mark 5/190° for about 15 to 18 minutes. Keep checking, once its a nice browned colour, take it out and cool it! It sounds so simple, but the first time I put all the ingredients together, I used butter from the fridge because the recipe said nothing about it needing to be softened. Lets just say that it didn’t work and it all got thrown in the recycling bin. Next, I melted the 4 oz butter in the microwave and got a fluffier consistency when I mixed it with my sugar. Great! Then I added in the flour. It all went well, but when I needed to knead it, it all fell apart in my hands. So, instead of giving up, I melted another oz of butter and folded it in as best I could. Once the dough was done, all I had to do is roll it out and cut them in to shapes. Most people do fingers, but I just used a cookie cutter to make some circles! I have no patience when it comes to making it all one level, and mine were too thin, so the baking times were completely off! All I had to then is poke them with holes using a fork and put them on a tray backed with some baking paper! 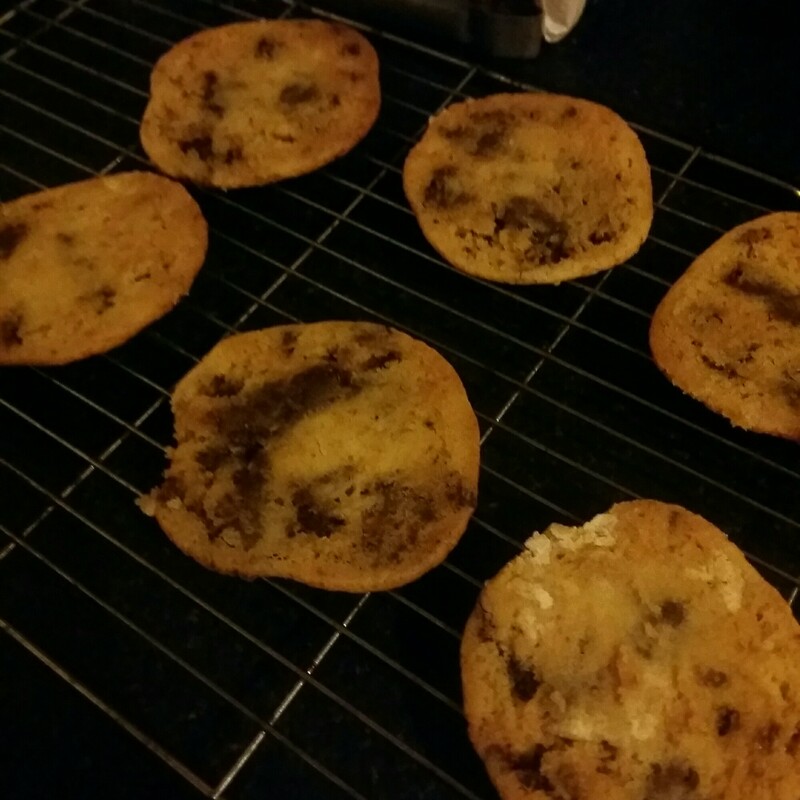 It’s probably because they weren’t 1 cm thick, and so baking times were completely off, but hey how, they still tasted nice, just slightly more crunchy. My next batch went in for 15 minutes and came out a better colour. The first batch is in the background for reference. Also, as is the norm in my house, I always have a little ‘taste tester’ by my feet. Sometimes there’s also a cat, and a shihtzu, if I’m making a chicken curry, but Caden is forever there, making sure to clean up if I drop something. Next, to help me save them the best I could, I melted some chocolate and covered them in it. I’m honestly a person who thinks chocolate can save most things! 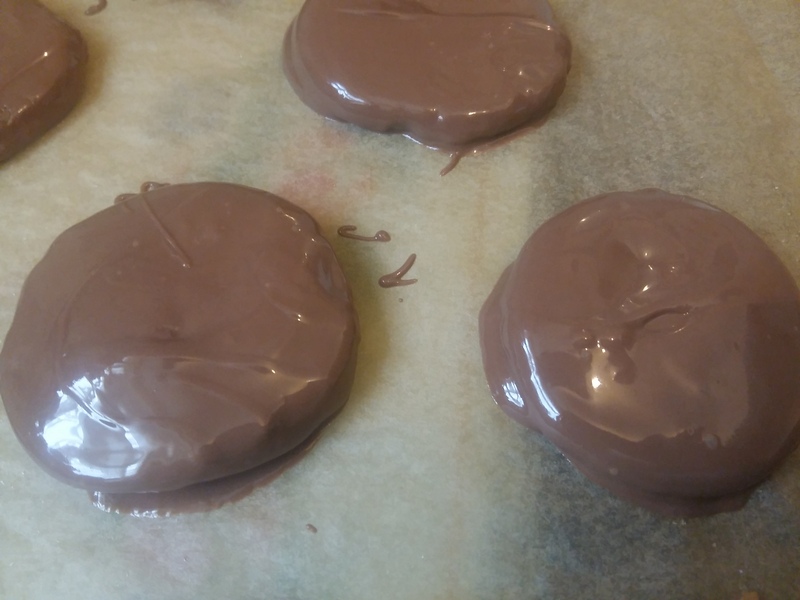 The process is the same as my wagon wheel chocolate covering, and more pictures of that can be found on this post. Once their covered, put them in the fridge for the chocolate to set! 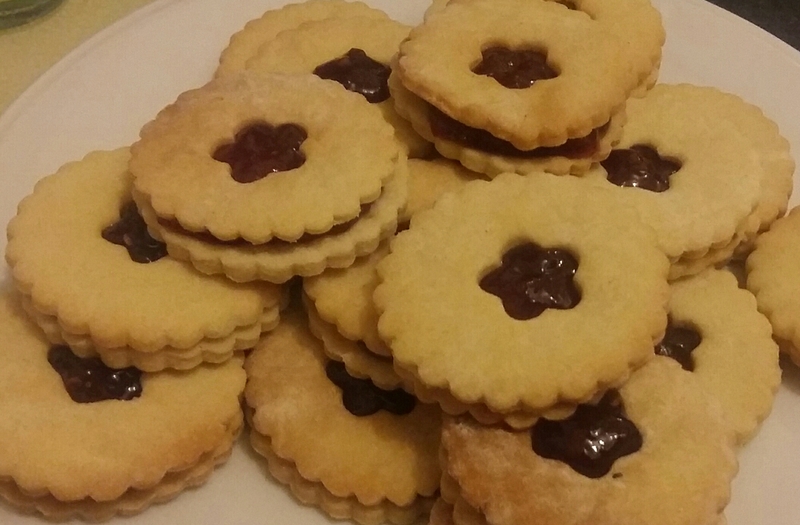 They may be a bit more crunchier than a normal shortbread biscuit, but they still taste just as good! These cookies are definitely for the people out there that love chocolate! Pre-heat the oven to 160°/Gas mark 3 before you start. So to begin, melt the milk chocolate and butter together in the microwave or over the hob. Then, beat in your eggs one at a time before adding in your sugar and mixing it all together. 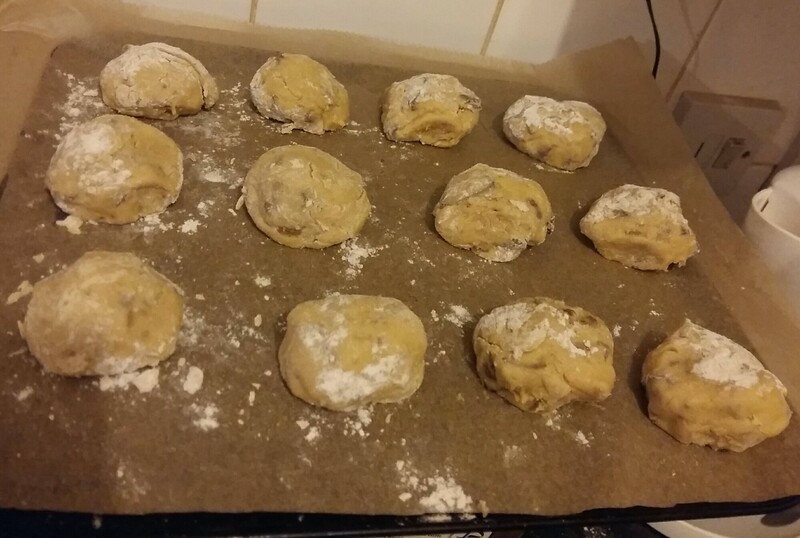 Next, sift in your dry ingredients (flour, cocoa, baking powder) gradually, folding it all in as you go. Chop your dark chocolate up and fold it in to your mixture. Let them cool on a wire rack for about fifteen minutes before carefully peeling them off the baking paper with a spatula, cake slice or something flattish and lie them upside down on the cooling rack for a little longer. You can eat these now, store them in an air-tight container or freeze them! 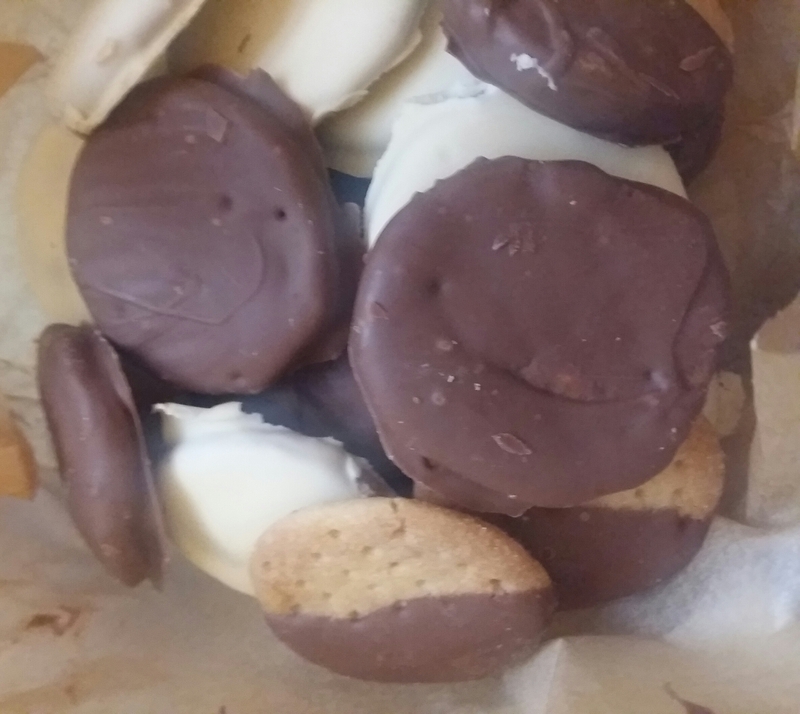 These are my well-loved Millies style cookies! They taste amazing and is one of the recipes that motivated me to bake more. 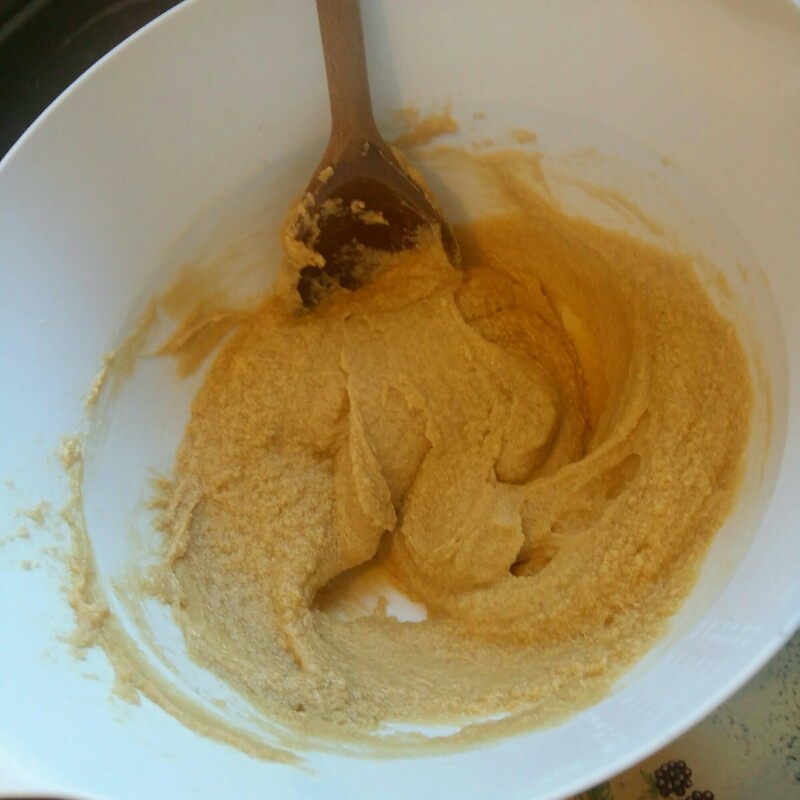 So, to begin, combine your sugars and your butter until its fluffy, and then add in your egg and vanilla extract! Now, the best bit! Chop up your chocolate in to peices or use chocolate chips and combine it with your mixture. I used half of the mixture with cadbury chocolate and half of it with terry chocolate orange. Once chilled, use a good amount of flour as a board and make little clumps of cookie dough and put it on to a tray with some baking paper. I got about 22 cookies out of the dough, but it depends how big or small you want them to be. The below picture, I packed the tray a bit tight, but they’ll be easy to cut apart when it’s cooked. It gives them a real homemade look, but if you prefer the rounded shapes, space them out a bit more. Now, pre-heat your oven to gas mark 4/180° and leave them in for 15 to 20 minutes, making sure to check them over. 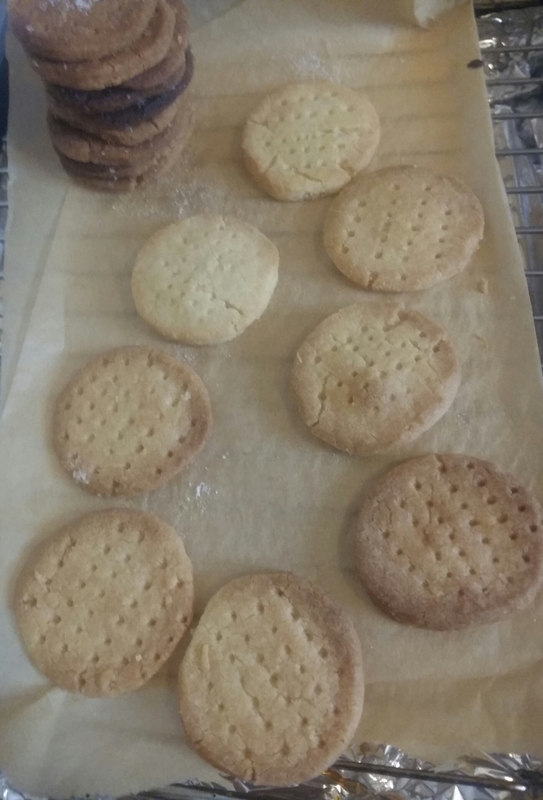 Let them cool on the rack with the baking paper below it for a couple minutes as taking them off too soon might end up with you losing half a cookie. Once its cooled a little, use a spatula or cake slice or something else flat to lift the cookie from the paper and place it back on the rack. I find its best if they are put on upside down so the bottom can set more. Once their cooled, you can store them in an airtight container and they can last for over a week (If you don’t eat them all by the next day like I do). Firstly, cream the icing sugar and butter together before adding in the eggs one at a time. 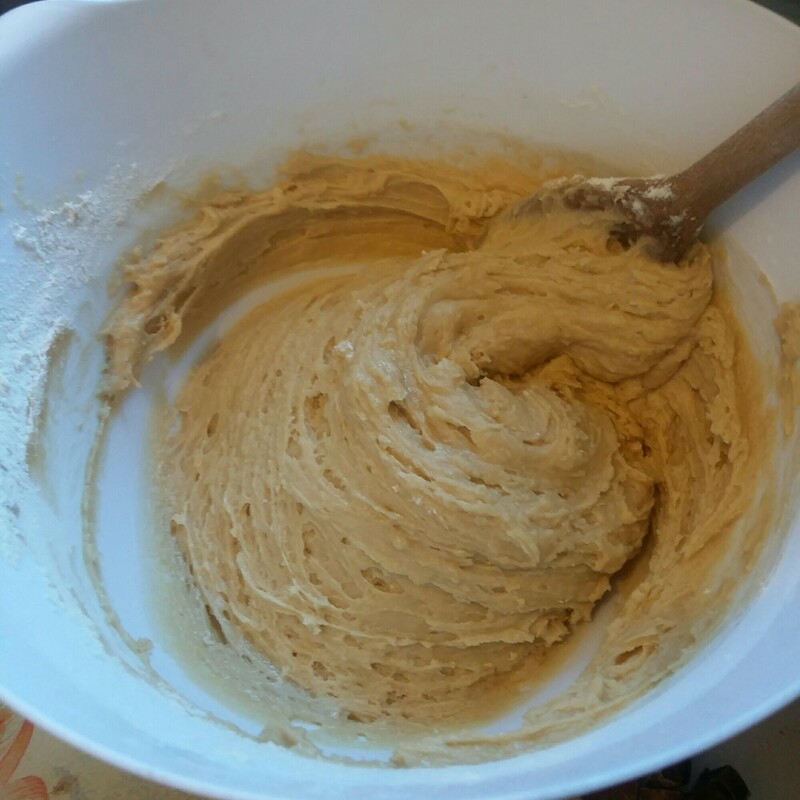 Next, fold in the flour a bit at a time and then separate the dough in to two. Wrap them up with clingfilm and put them in the fridge for about two hours. Right, next, preheat the oven to gas mark 5/190. 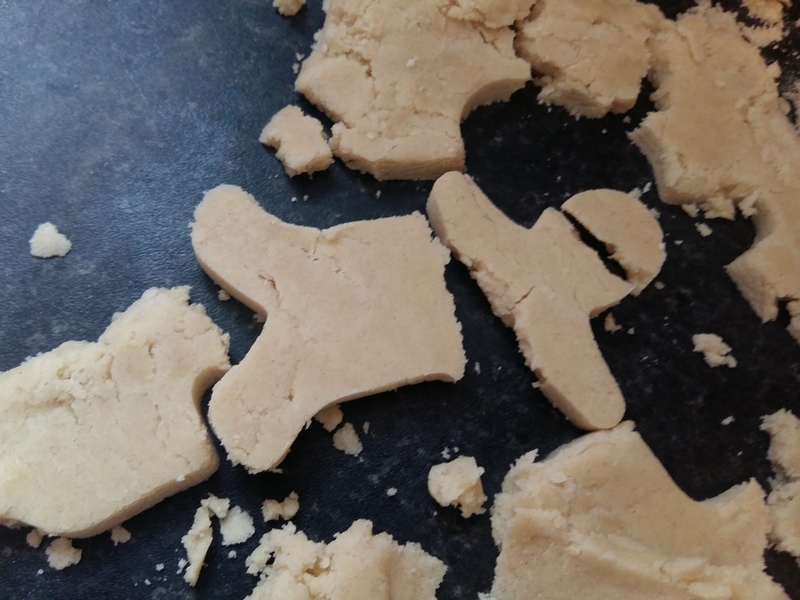 Roll out your dough to a £1 thickness and then using a cookie cutter, cut out your biscuits! Now, if you want to, take half and cut out a smaller hole in the middle. I used a little flower fondant tool! 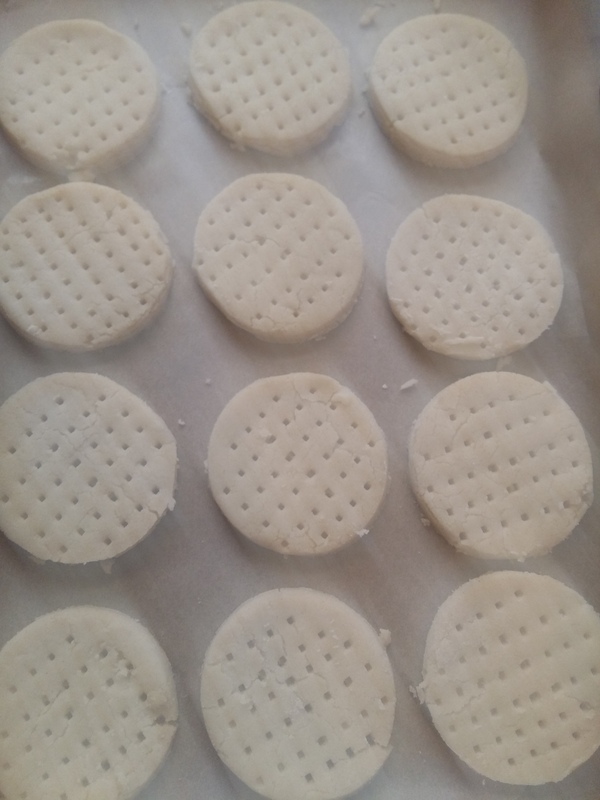 Place baking paper on a tray and lay down your biscuits. Bake them in the oven for 12 minutes and then cool them on a wire rack. One of mine was too close to the flame and burnt a bit! Once cooled, get your jam and sandwich it between two biscuits! Its up to you how much you want to put between them! They taste amazing! You can make them as big or as small as you want and as long as you keep to the £1 thickness, the baking time shouldn’t change. I love chocolate! So brownies are one of my favorite things! Firstly, mix the melted chocolate and butter together and then add in the caster sugar and your four eggs, mixing well. This should be followed by the vanilla essence, and then the folding in of your flour and cocoa powder. You should end up with a lovely liquidly mixture. Next, line an 8 inch baking tray with bake paper and pour the mixture in! Bake in a pre-heated oven at 180° for 25 minutes. You can decorate with buttercream or eat warm with ice cream. 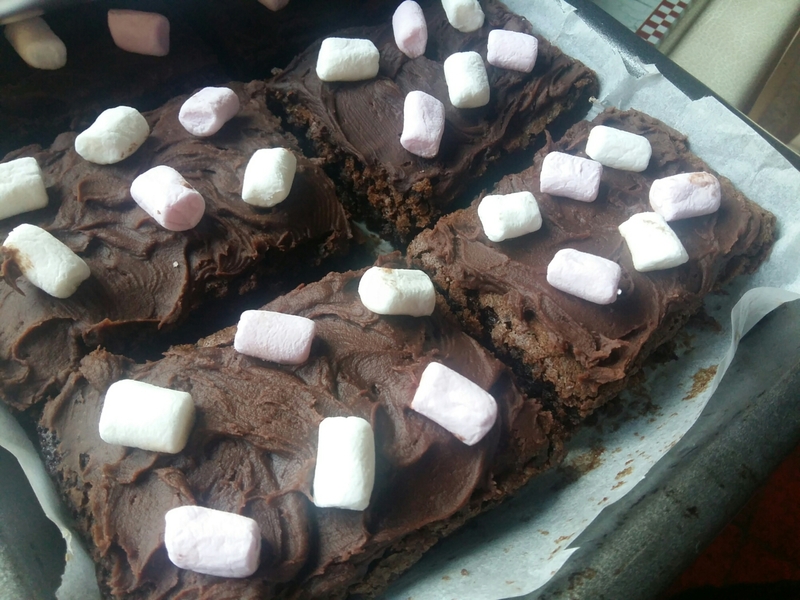 Ours were decorated for a bake sale with chocolate buttercream and mini marshmallows! These are beautiful, I hope you enjoy and love them as much as I do!